Brief history of C.M.O. 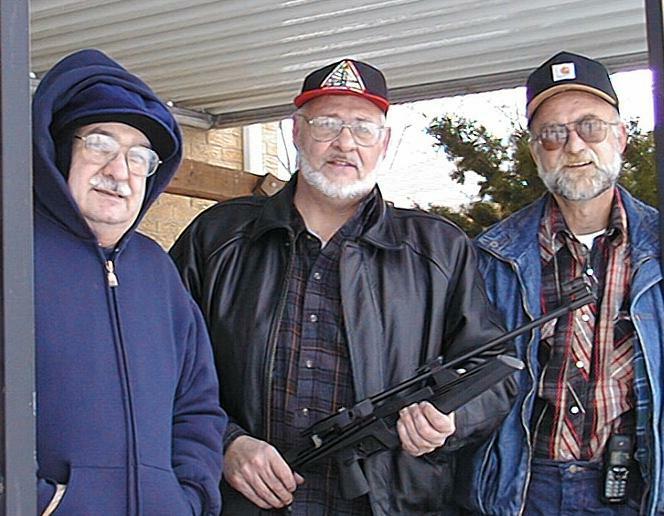 - Thom and Ray really had the desire for an air gun club in the area. They had talked about it over the last few months and then Dave contacted Thom after seeing a post on one of the forums. They got together at a local restaurant and decided to go for it. The name came out of Thom's love of plinking pop cans. He told Ray and Dave he loved to mangle some pop cans. So at his suggestion, we decided to call the club the "Can Manglers of Ohio". Rather catchy we think. We can't wait to get new T-shirts made up with our logo on it. If you have never had the experience of shooting air guns come out and get involved. It is a great activity and the folks who shoot air guns are great people. From professionals to blue collar workers, no one is left out. Men and women, boys and girls of all ages are all welcome. The history of air guns goes way back to early 1700's. Lewis of Lewis and Clark carried an air rifle, 36 caliber, that the Indians called a "magic stick" since it made no noise and no smoke came out of it. Numerous air rifles were made throughout this period. An army of 500 soldiers carrying these weapons could get off 300,000 shots in an hour. This was a force that Napolean feared. If a enemy soldier was found carrying an air rifle, he was hung on the spot. Today modern air guns have unbelievable accuracy and power. Varmint hunting of coyotes, crows, starlings, etc. is a sport practiced globally now with numbers growing rapidly. Small game hunting has its place with air guns also. Rabbits and squirrels are the number one choice to hunt, but other criiters such as ground hog can be hunted successfully. Field Target competitions are conducted all around the world. Great Britain and Autralia along with Europe really started this sport fairly recently and it has found it's way to the USA with a passion. Ray Titcombe has had vast experience in competition shooting with firearms. But in 1991, he got "bored" with firearms and decided to get more active in air guns. He does a lot of his repair and modification on his own guns. Both Dave and Thom look forward to learning a lot from Ray. He will provide some great guidance to new shooters as the club grows. Thom Grosse has had quite a few years shooting both air guns and firearms. He has ability from his profession as an occupational therapist to built molds and such which will help out other gunners needs. He has a desire to see young men and teen agers get involved into our sport and hopes to be able to make our club available to church youth groups, Boy's/Girl's Clubs, Boy Scouts, etc. Dave Baker is the newcomer to air guns but has shot firearms all his life. He loves the outdoors and nature. He hopes to provide hunting lessons to young people and adults who have never had the experience before. PLEASE NOTE!! !All children under age 18 must be accompanied by a parent or legal guardian at shoots. Adult supervison at all times of children is mandatory. Air guns are not toys and must be treated with the respect that they warrant.